SSI offers both Site Surveys and Power Quality Surveys. How do they differ? In over 80% of cases, surges can be identified and mitigated the the correct application and installation of surge protective devices. 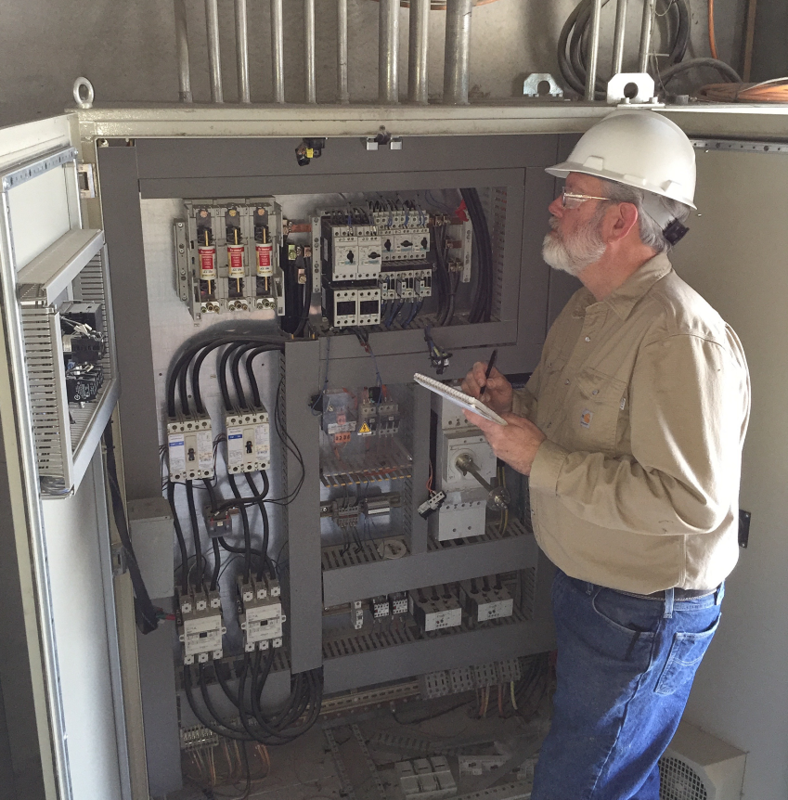 During a site survey, qualified SSI discuss symptoms of power quality issues, review machinery and equipment, and determine the best application and location of any necessary equipment to mitigate transients. In many cases, existing surge protectors can be relocated to more optimal locations to increase effectiveness. In extreme cases, a Power Quality Survey may be needed to identify latent, but extreme issues like repetitive destruction of drives or computer boards. Have you recently relocated your computerized office operations into new, or remodeled, facilities? Was it built to local code, but without consideration for the special problems computers and other office electronics can create on an electrical system? Were the new electronic process controllers for your assembly line installed without upgrading the facility electrical system? If so, then you could be sitting on a ticking bomb. The switching power supplies and non-linear loads of most computers, other office electronics and building electronics such as elevator controls, environmental system controls, variable speed drives and process controllers can create harmonic and transient loads on the systems. These loads can result in everything from the nuisance tripping of breakers to serious overheating and burnout of wiring, capacitor banks, transformers and your entire electrical system. Don't let these problems continue to build within your system until they reach dangerous levels. It makes sense to find out not only whether you have problems within your electrical system, but also to find out specifically what type of problems you might have before trying to apply solutions. The wrong solution is no solution. Surge Suppression Incorporated Technical Services is ready to help you correctly identify and eliminate these threats to your safety and continued operations. The business community is beginning to realize that they can no longer operate with the same general acceptance of the condition of their electrical system that they have survived in the past. The cost of energy, equipment and downtime are taking increasingly larger percentages of their operating budgets. Even with the introduction of electronic controls and computers, devices which were supposed to speed production and reduce costs, the business and plant manager is seeing those benefits eaten away by problems within the electrical system and by operational incompatibility. ENVIRONMENT: The proliferation of electronic controls in the business and industrial environment has significantly changed the way equipment operates and interacts. The National Electric Code (N.E.C. ), and the local electrical codes which are generally adopted from the N.E.C., was written several years ago and in the time of linear electrical systems. The introduction of the computer in the office place has created significant improvements in operational capabilities. It has also created significant demands for improvements in the quality of power supplied to the sensitive electronic equipment. PROBLEM: A third significant change that has gone mostly unnoticed is that this electronic equipment has introduced its own disturbances and distortions onto the electrical system. These disturbances can range from nuisance causing events such as tripping of breakers to severe hazards such as burned wiring and exploding transformers. Office buildings which utilize a large number of computers and other electronic equipment require specific types of electrical power systems. This includes non-standard types of transformers, wiring, grounding and circuit layouts. Companies which already operate in office buildings which have not incorporated these non-standard types of equipment and design are operating in an electrical environment which may be deteriorating with every day of use. The cumulative effects of these disturbances can result in losses of information, equipment, facilities and even personnel. Industrial facilities have also seen a rapid shift to electronic controls for everything from simple motors to complete assembly line processes. The electronic loads on these systems are mostly non-linear. They create extremely large distortions in both voltage and current on the system. They interact with other electronic and even basic electrical equipment in various ways, some of which can have violent results. Even equipment designed to mitigate disturbances within an electrical system may not be compatible with everything on the system. The results of all of these problems on the commercial and industrial users electrical system can be catastrophic. But, there is also the energy factor to consider. Virtually all of the disturbances cause some type of direct heat buildup, or deterioration of equipment or connections which also results in heat buildup. This heat buildup is energy being lost to non- productive use of current. Voltage within a system is relatively stable and designed to operate within certain general parameters. The current or amperes used on a system is the variable which determines how much a user pays the power company for the energy delivered. The more equipment in use and the heavier the load, the more current will be required to provide the energy to do the work. The current is measured in KWH or kilowatt hours. If energy is being converted to heat within the system due to poor power quality and control, the KWH readings on the system meter will be higher than necessary to do the work alone. SOLUTION: Even in the early 1990's an article by Robert D. Hof, in the Science & Technology section of the April 8, 1991 issue of Business Week magazine, notes the estimated $26 billion a year in lost time and revenue power-related problems are costing U.S. companies. The amount of computer controlled equipment in use by companies today has grown exponentially since Robert D. Hof's article first made the news cycle. The technology and expertise necessary to track down and eliminate these disturbances from a system do exist. They are not readily available within every plant because of equipment costs, training, experience and staffing requirements for an effective power quality effort. But, the need for a true power quality program is becoming a basic survival requirement for many businesses operating today, and the need is growing. At SSI we believe education is important, and we want you to be informed of how properly applied and installed surge protection can prolong the life of your equipment and machinery. The five hour seminar runs from 8 AM to 1 PM, includes lunch and covers all eight sections listed below. Attendees are eligible for .5 IEEE Continuing Education Units or 5 Professional Development Hours. If you are unable to attend one of our Seminars in person, we also offer educational opportunities through Webinars. Receive the same educational opportunity offered at our live seminars while in your own home or office. For more details, click on the button below, and we will send you all the necessary registration information.